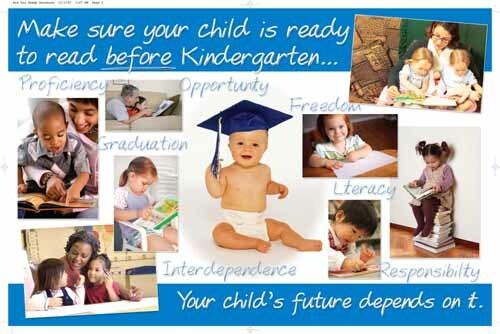 The USA Values proposal to School districts, cities, culture, community groups, and the business community is to be certain your children are ready to read before kindergarten. You may almost demand that the school district help with the program to make that certain. Your desire is to go around or under the present child care or preschool systems with just the ready to read skills defined by the language pedagogy of the Montessori Method or something similar. This pedagogy would be delivered by an assigned mentor to mother and child as a cost of the school district funded by the private sector. The school district would pay the fee of $5,000 per year for 2 years per child. The school district is vested in 100% of the children being ready to read at the start of kindergarten. The culture cannot wait. The top quality levels of the kindergarten starts are already ready to read. However, the whole system of child care and preschool is not focused on the children actually being ready to read. This is setting a low standard low standard. Position of the delivery as above the law would be meaningful to avoid the status quo. This pedagogy is actually an addition to the Indicators of Progress, The QRIS definitions of readiness and the CLASS systems of evaluation within the Parent Aware System or those like it. The culture’s authority to ask for this gap reduction effort is already under the school readiness law 124D.15 and is brought to bear district by district under section 120B.11 for the at risk children. Without asset or means testing the only requirement should be that mom asks for the mentoring help understanding the effort required. The early special education law would be used aggressively locally by the district to add to the above for the children it is designed to help. Ultimately, this pedagogy would be added to all the many pre-k delivery systems and be made a part of the Indicators of Progress. With the advent of all day kindergarten the Indicators of Progress can easily be expanded to include being ready to read at age 5.5. This is a pedagogy that really needs to start no later than age 3. So one year of Pre-k is not adequate and it is really not okay to try to cover this activity based learning in one year after the kindergarten start. The pedagogy is written and tested for mentor delivery to child and mother. That writing is published in one example by Lynne Lawrence as Montessori Read and Write copyright 1998. 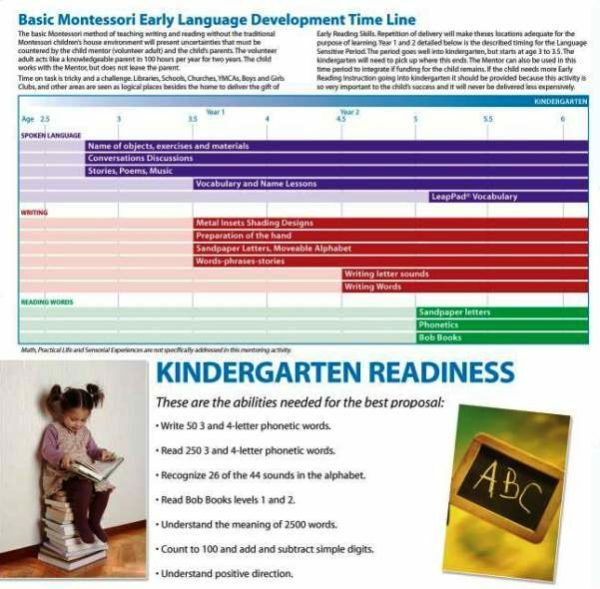 The school district can afford this early reading skills delivery because of the benefits it will gain in the later years tranche by tranche. When the attempt is made to have 100% of the children ready the benefits expected will go off the chart. If a bridge loan is needed for each tranche of children starting kindergarten, most or all districts have access to that capital as a matter of operations. The positioning of the delivery is actually to be paid for by the private sector without impacting the present budgets. The emotional presentation within the district and the community / culture will take on the substance of chapter 28 of the Absorbent Mind by Maria Montessori. This caps the iconic presentation by Maria Montessori of the Child’s Development and what we adults can do to help between the ages of 0-6. Montessori represents and proves it with annual demonstrations that the child is wired to be reading at age 6. It is demonstrated all the time within the plus 6000 schools in our country alone. Our ERSD-RA is about being ready to read at age 5 or after 2 years of effort going into kindergarten and reading at age 6. This ends up being a bottoms up delivery of readiness to the school districts. In some respect the school district might well resist this additional gap filling effort on their dime, because of the status quo. But with the proper relationship to the innovations and positive expectations for removing the gap before it starts one would hope the district would be encouraging. In certain conditions the delivery of readiness might actually be guaranteed to the district by the mentor. Cities and culture groups see the gap reduction as economic development. Often this is tied to poverty gap reduction and must of course fit within the concepts of Disparities and Race. Importantly, ERSD-RA or something like it could be seen as the high intensity extra early help our most at risk need as discussed by Chester Finn Jr. in Reroute the Preschool Juggernaut where he is openly critical to the wide spread universal plans rather than the targeted to the most at risk plans that would actually close gaps. It is very easy to actually lay out the pedagogy on a table and see the missing parts. He and others are critical in not using hard to reach budget dollars for the most at risk first things first. must embrace this innovation as described here.